Search events in Broward & Miami-Dade counties and surrounding areas. 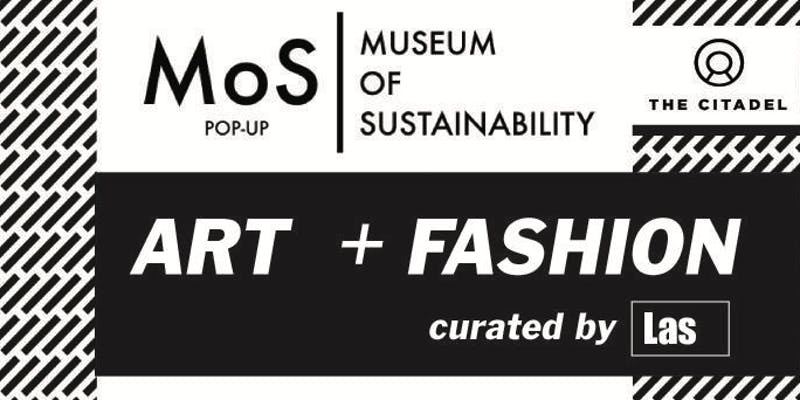 Submit your event. Journey back in time as you explore this exhibit that includes life-size animatronic Triceratops, Raptors, Tyrannosaurus Rex and a giant Spinosaurus. Included with paid admission of $17.95/adult, $13.95/child. April 15 – Can You Ever Forgive Me? Kids can decorate planters and plant seeds on Earth Day. Get creative by making an Earth-friendly Chihuly styled art craft using recycled materials. Ages 8 and up. Join the South Florida Science Center and Aquarium in learning the best ways to grow flowers and plants by conducting a seed bomb experiment at Boynton Beach Mall. Take home a ready-to-grow seed and celebrate our planet! The college admissions process can be confusing and stressful. In this presentation, parents of students in 8th-11th grades will learn how to assist their children in gaining admission to the college of their choice. Students need parental support and help. As importantly, parents need to know when to step back for their student’s own benefit. Andy Greenspan is a Director of College Advising at International College Counselors, one of the top private college advising companies in Palm Beach. Andy received his BA from Columbia University and MS from Northwestern University. Prior to working at ICC, Andy served as an alumni interviewer at Columbia University and consulted for colleges including Princeton, Yale, Duke and the University of Chicago. Have some old-fashioned fun playing board games and cards with the kids. Games provided. An art program especially for little ones designed to foster new discoveries in sensory awareness, creativity, and pre-literacy skills through hands-on activities. $10. Ages 2-4. 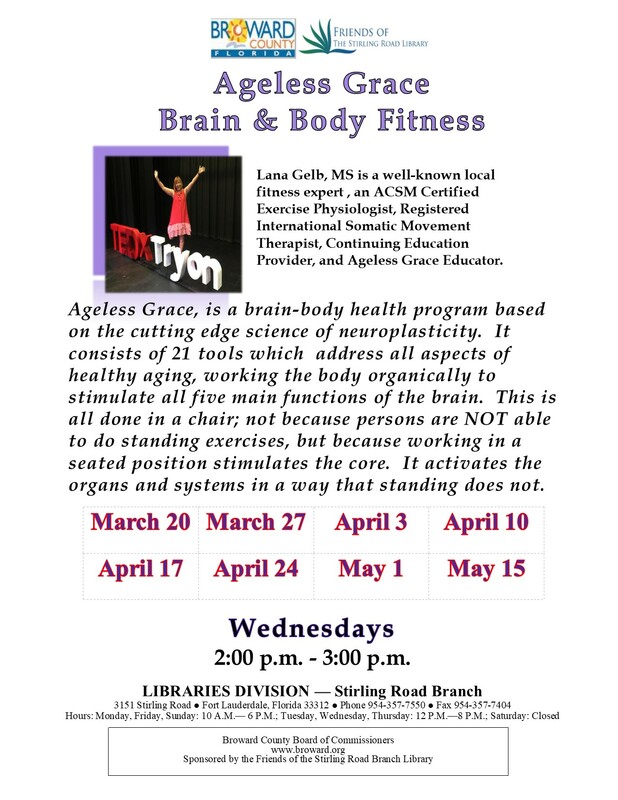 Ageless Grace is a brain-body health program based on the cutting edge science of neuroplasticity. It consists of 21 tools which address all aspects of healthy aging, working the body organically to stimulate all five main functions of the brain. 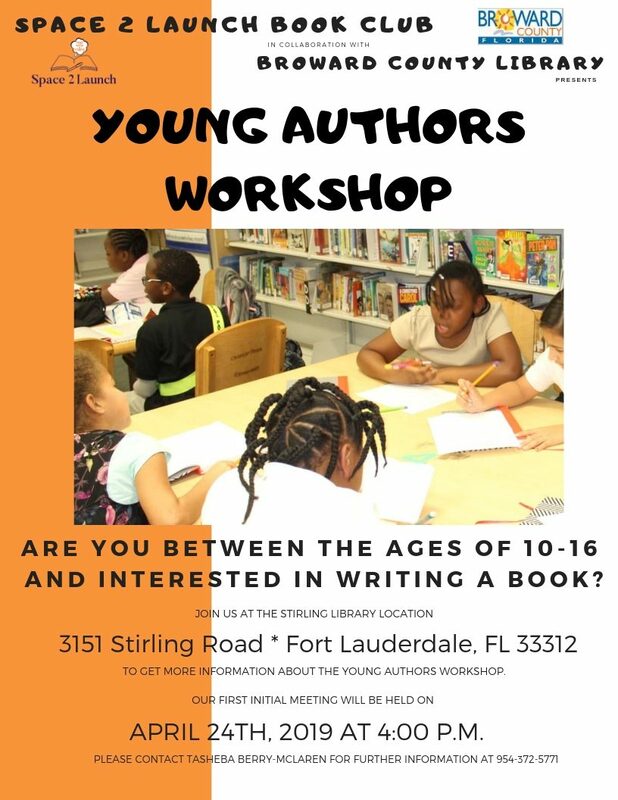 Are you between the ages of 10-16 and interested in writing a book? Join us at the Stirling Road Library for this special workshop series that runs through July 31st. Free Event, Open to the Public. 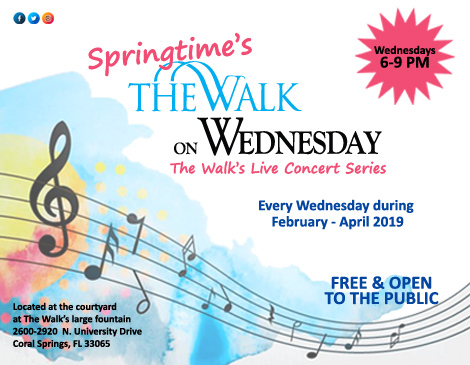 Join The Walk for their spring weekly concert series, The Walk on Wednesdays, from February through April 2019 – every Wednesday from 6PM to 9PM! Music is located at the courtyard next to BurgerFi across from the large fountain at The Walk. Bring your own chair or blanket! Events are weather permitting and subject to cancellation and change without notice. 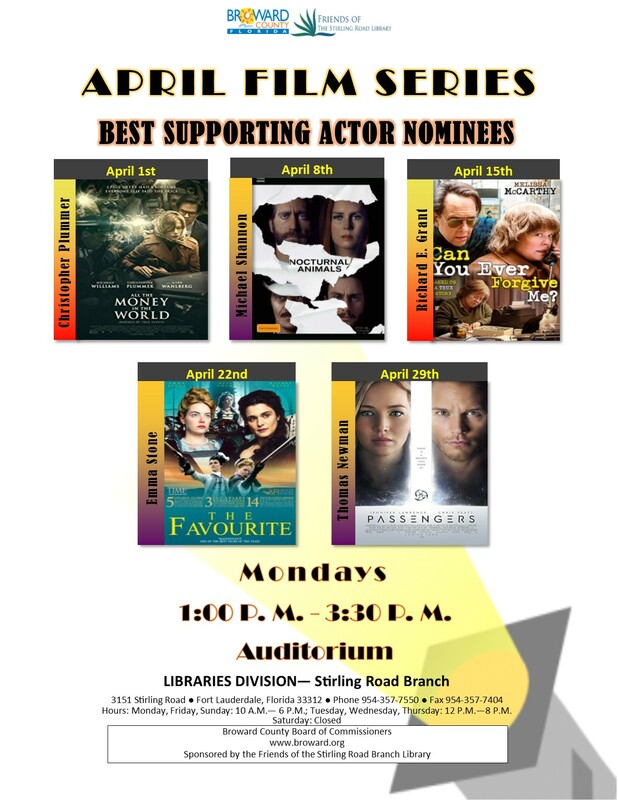 Here’s what’s playing at The Walk at Coral Springs every Wednesday 6-9PM through April 2019! February 20 – Where’s George? March 27 – Where’s George? April 24 – Where’s George? A special PajamaRama event with activities and a craft to celebrate Earth Day. Lip-smacking event with food, arts and crafts, activities and a full lineup of musical entertainment. Along Pompano Beach. Celebrate the birthday of Hans Christian Andersen by choosing a fairy tale story quote and creating your own illustration using coloring pencils, markers and water color. 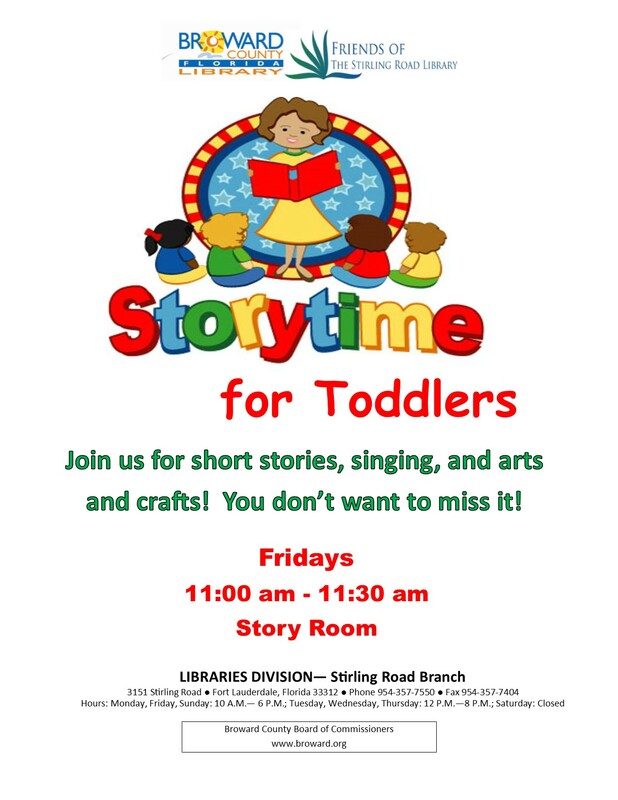 Toddler Story Time @ Stirling Road Library Join us for some short stories, singing, and arts and crafts! You don't want to miss it! 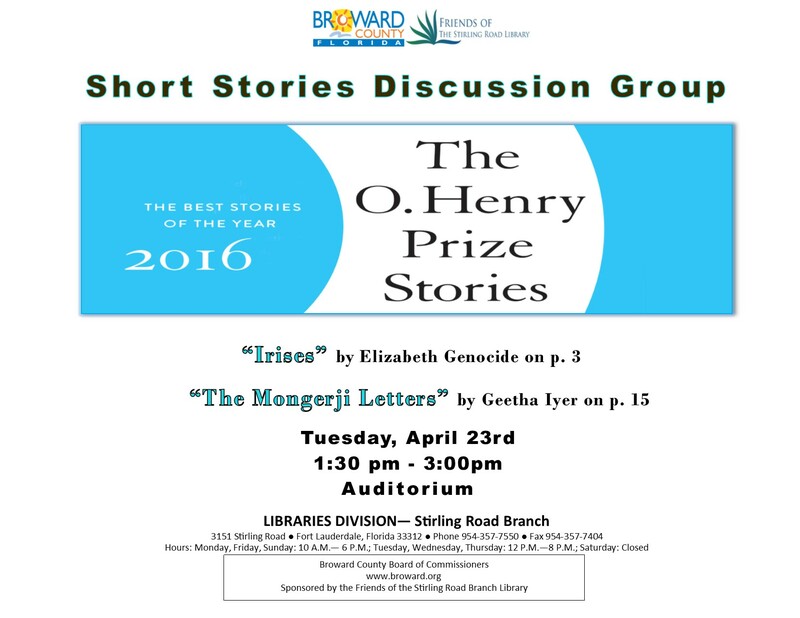 Join us for some short stories, singing, and arts and crafts! You don’t want to miss it! Middle and High School students can socialize and participate in a night of fun, games, sports, activities and more. Free. Jimmy and the comical cat Pete set off on an adventure of friendship all the way to Paris and back in a VW bus. 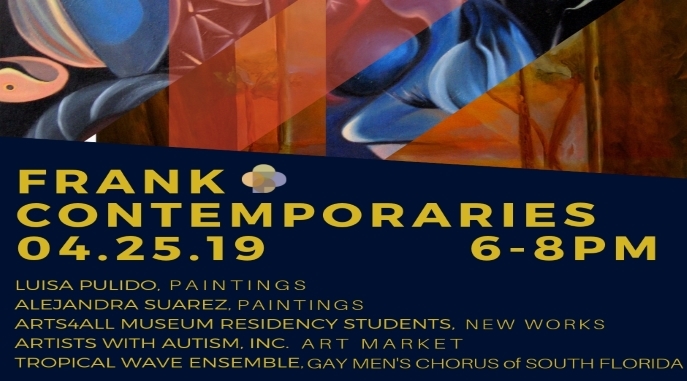 Tickets include pre-show art activities and a sweet treat after the show. $14-$18. 11am, 1pm & 3pm (sensory friendly). An expo for those who love the ocean, with marine artists, guest speakers, and exhibitors of freediving, spearfishing, scuba diving and underwater photography. $20/day. 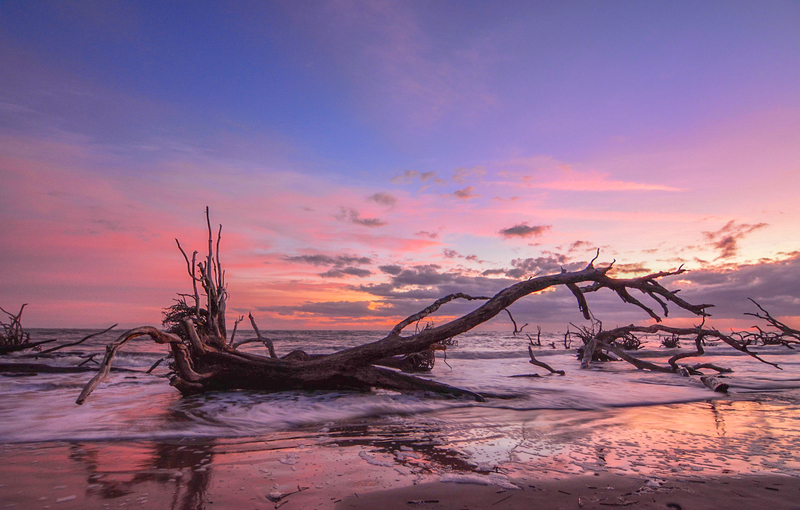 Join other families for a beach or mangrove clean up organized by the Gumbo Limbo Nature Center. Kids welcome, but must be accompanied by an adult. Pre-registration required. Surfers for Autism takes children and young adults with autism or related disabilities surfing. At a Surfers for Autism event, our surfers are provided a safe, fun, judgment free environment where our volunteer surf instructors carefully guide them into waves. Our surfers and their families are treated like rock stars and enjoy a day filled with a range of activities. Depending on location the day’s activities may include stand up paddle boarding, music, face-painting, games, bounce houses, fire engine tours, paint the fire engine and much more. A catered lunch is also provided, all at no cost to anyone. This is a very special day where children with ASD interact with typical peers and wow families with their capabilities. These events are examples of inclusion at the highest level. 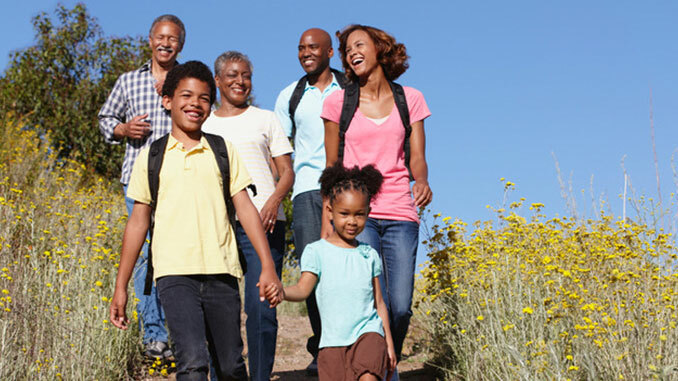 An annual Earth Day celebration with fun-filled conservation themed activities. Included with paid zoo admission. Those who bring along a cell phone to donate to the ECO-CELL recycling program receive free admission. Join Frost Science in a BioBlitz by exploring the biodiversity of our land and water as cities around the world compete to see who can make the most observations of nature, find the most species and engage the most people. Children must be accompanied by an adult. Pre-registration required, on-site registration is available on a first-come, first-serve basis. Navigating the college admissions process can be both exciting and overwhelming. 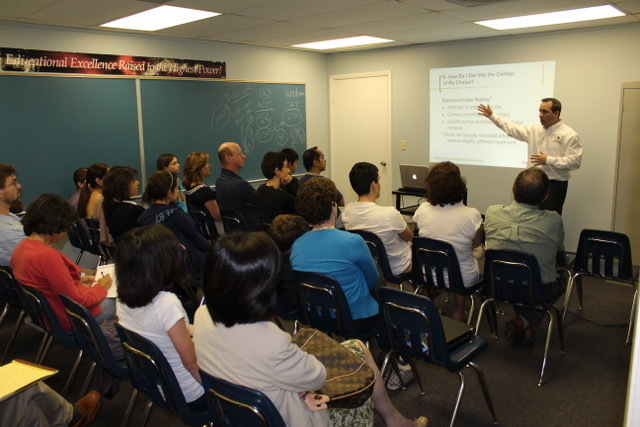 In this presentation, Andy Greenspan, Director of College Advising at International College Counselors, will simplify the college application process from start to finish. Topics addressed will include current trends in admissions, building a balanced list of colleges, favored extracurricular activities, and the different components of the college application including essays, transcripts, and interviews. Beyond the basics, Mr. Greenspan will expand on elements which can increase a student’s chances of admission, including early action/early decision options, demonstrated interest, and more. Participants will leave this session knowing more about the college admissions process and with a better plan for applying and getting accepted to college. Free and Open to parents and students in 8th-11th grades. A Question & Answer session will follow the presentation, so come ready to ask questions! Artist Laura Marsh is known for her vibrant “identity banners,” which represent the desire to become an inclusive society that recognizes diversity as a positive sign of cultural strength. 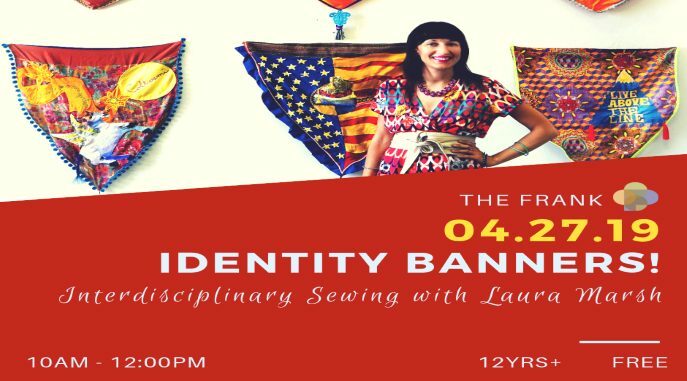 In this art-making workshop, Laura will lead students through introductory sewing techniques and have them explore and analyze their identities to create their own bold, colorful identity banners. The event is free and open to the public. All materials provided and no prior experience is required. 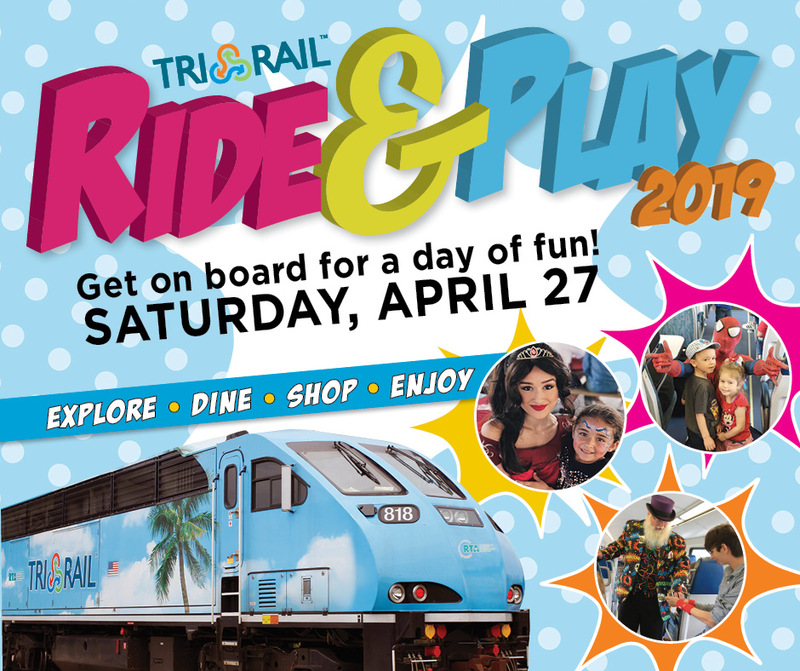 Hop aboard Tri-Rail to explore, shop, dine and play while connecting to South Florida’s most popular family friendly attractions during “Ride & Play” Day! Riders can show their validated fare at regional attractions and stores in Miami-Dade, Broward and Palm Beach Counties to enjoy discounts and special offers. Catch a train from 18 conveniently located stations every hour on weekends and holidays. Train service is available, daily, with bus and Metrorail connections. Tri-Rail’s weekend fares are just $5 roundtrip and kids under 5 ride free. Children ages 5 to 12 receive a 50% discount by obtaining an EASY Card from a Tri-Rail Station Agent at select stations. A fun-filled hometown birthday celebration with entertainment, a Royal Court Pageant, live music and more. The event recognizes the city’s 59th birthday. The Expo is like “speed dating” for volunteer work. On one day, in one place, teens and adults will be able to match their interests with various organizations. Within two hours, attendees can sample between 25-40 different organizations, both large and small. They will have an opportunity to talk to the people who manage the organization’s volunteer programs, as well as other adults or teens who have volunteered for the organization. 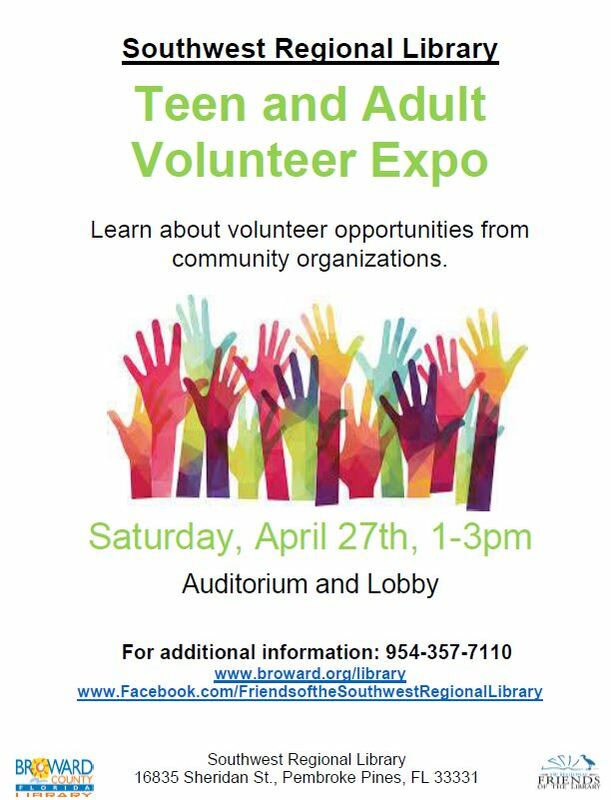 The Teen & Adult Volunteer Expo event will be held on April 27, from 1pm-3pm, at the Broward County Southwest Regional Library, located at 16835 Sheridan Street in Pembroke Pines. On one day, in one place, teens and adults will be able to match their interests with various organizations. Within two hours, attendees can sample between 25-40 different organizations, both large and small. They will have an opportunity to talk to the people who manage the organization’s volunteer programs, as well as other adults or teens who have volunteered for the organization. See top UFC athletes compete inside the octagon. Arts Ballet Theatre of Florida's stunning season Spring Gala finale consists of a repertoire of classic ballet excerpts. $35. Arts Ballet Theatre of Florida’s stunning season Spring Gala finale consists of a repertoire of classic ballet excerpts. $35. See amazing acrobatic feats, traditional dance and stunning costumes as this premier Chinese acrobatic company performs. $37-$42. 1:30pm & 6:30pm. Children can release their inner Picasso by creating arts and crafts under the palms using a variety of mediums and materials. Pre-registration required. Free. A super fun celebration with superheroes, a bike valet, arts and crafts, music, a ladybug release and more. A one-day jazz festival with western flare featuring a various of musical acts by national artists and local schools. Gates open at noon. $30-$65. 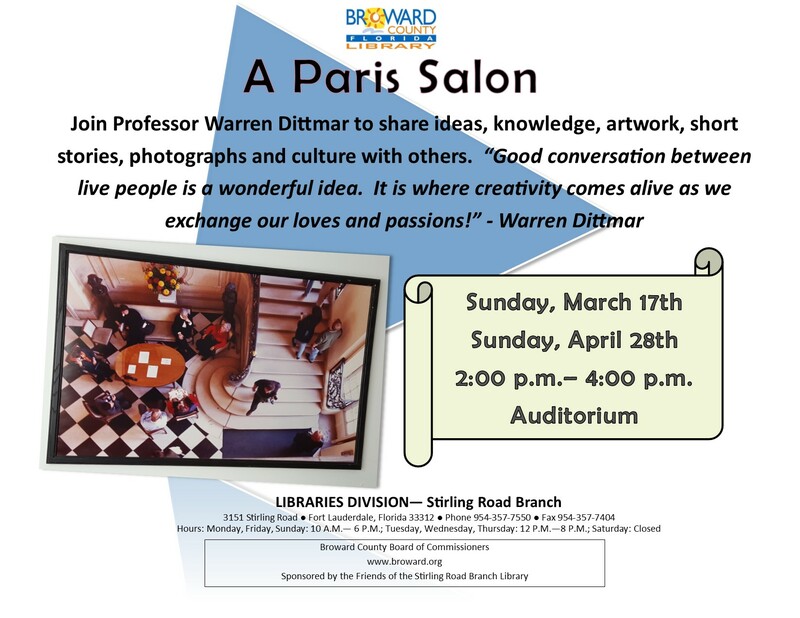 Join Professor Warren Dittmar to share ideas, knowledge, artwork, short stories, photographs and culture with others. 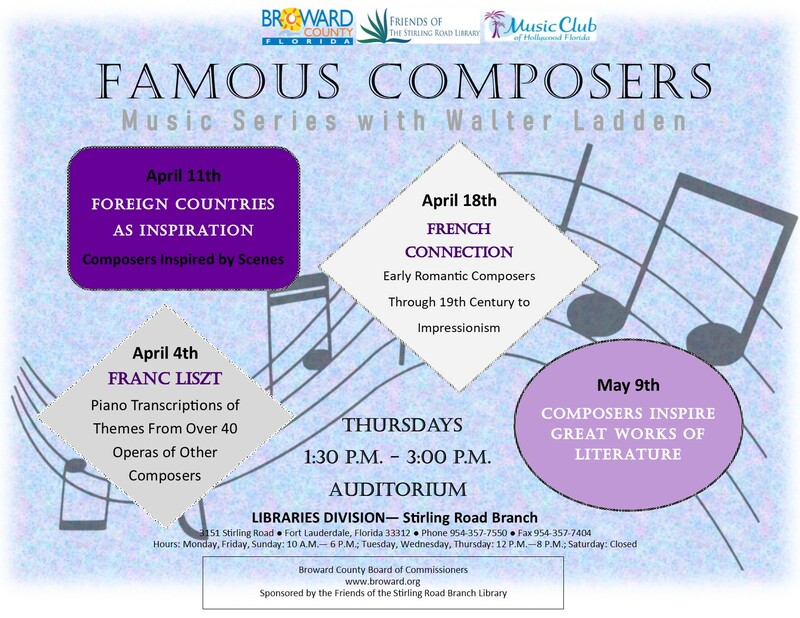 Concert series features an all-Chopin program presented by local piano students. Free. Mother’s May Wellness is a series that offers a variety of events and activities catered to moms in celebration of Mother’s Day. Join a 30-minute mat Pilates class for fellow moms looking to stretch and strengthen their bodies by engaging their core. Also learn the do’s and don’ts of running a healthy kitchen at home with advice from the experts. *Program, instructors and locations subject to change without prior notice.